There’s no need to beat around the bush: having back hair is a reality most men face. However, while having the bushy beard of a lumberjack may be your ideal style for your face, not every guy is so keen on having the hairy back of a bear. Some men have very little hair on their backs, but for men who grow great tufts or patches of hair, its presence can be a nuisance. Fortunately, for the hairy-backed men of the world, there are several high-quality back shavers on the market that can help you simply shave off any unwanted hair you have growing on that area of your body. 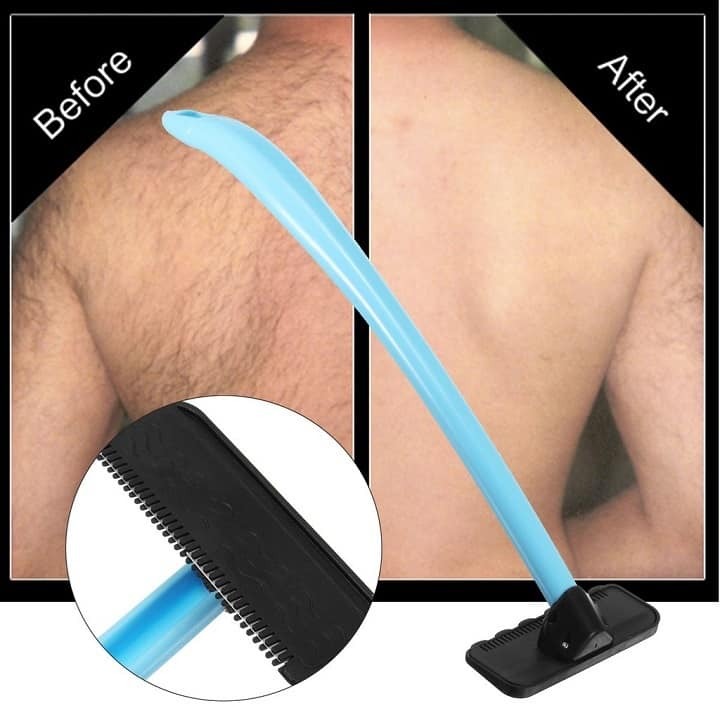 When it comes to cutting or shaving off hair from any part of your body – whether it be your face, arms, legs, or other areas – you can’t expect good, or let’s face it, painless results without investing in something a little more efficient than a $3 disposable razor from a drugstore variety pack. There’s no shame in shaving unwanted back hair – but there’s a little shame in letting yourself carry on with another hair removal method that hands-down cannot rival the results of the best electric groomer for your facial hair or body. Veering away from some of our recommendations for beard products such as the best beard conditioner or best beard butter to groom the man fur on your face – we have developed a comprehensive guide for properly shaving your back with a shaving tool you can trust. Continue reading below to learn more about the benefits of shaving your back, which professional shavette may work best for you, and to check out our step-by-step guide on how to handle your shaver like a pro. What Is a Back Shaver? Unlike general razors or shaving devices for your facial hair, a back shaver is a personal grooming device designed specifically to remove hair off of your back. It can be used to completely remove the hair, or to otherwise better maintain it. These shavers are larger than your general razor, typically featuring a long, ergonomic handle that allows users to reach all areas of the back with relative ease. Back shavers are also available as either manual, electric, or battery-powered devices depending on your own personal preference. These devices are hair removal tools that are specially designed to maintain or get rid of back hair. If you have unwanted hair growing where you don’t want, what more could you want? Shave either in or out of the shower. While not all shavers offer this advantage – particularly electric models – most decent shavers can be used wet or dry. Plus, at some point, even if you use a styptic pencil or buy alum block, all the nicks and cuts you’ll get from using a low-quality razor will have your back looking uncomfortably similar to that childhood bout of chickenpox you never want to remember again. Or worse, a visual parallel to the Bacne Backocalype days. Or, heck, if you still have issues with bacne, investing in a good quality shaver becomes only more important. Leave the redness, irritation spots, and patchy stray hairs in the past. If you have hair growing on your back that you’d banish to the Shadow Realm if it were possible – don’t make its removal harder than it needs to be. A good shaver with a long handle will help you reach all the hard-to-reach spots of back and – to be frank – just get the damn job done. Choosing the best back shaver largely depends not only on the reputation of the brand you buy, but on individual needs, like skin sensitivity, the weight of the product, or whether you’d prefer an electrical, manual, or battery-powered product. Nonetheless, there are several attributes across the board that you should be looking for when purchasing a back shaver for yourself or one of your bros (because, why not?). Let’s face it, the best straight razor for your face is not going to be the best method of hair removal for your back. 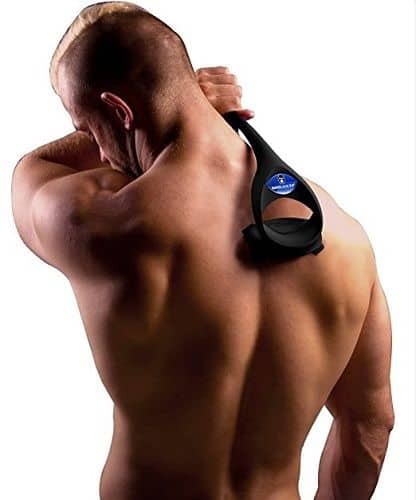 The best back shaving tools are specially designed to feature a long handle, which helps you to reach all areas on your back without having to go through the embarrassment of asking someone to help. It’s only practical to buy from a manufacturer that offers a warranty on your razor, as the components of these products can wear over time. Although shavers are generally more affordable than other methods of hair removal, you’re still going to want to look for the best value for your buck. Keep an eye on accessory and replacement costs for components such as replacement blades, batteries (if battery-powered), and cartridges. Quality back razors, whether electric or manual, feature blades that are installed at an angle specially designed to be effective against ingrown hairs. If you are looking for the best razor for sensitive skin, for instance, you may want to check out tools like the Potou Back Shaver, which features added safeguards to help you avoid experiencing skin irritation. Pair your perfect back shaver with the best anti-dandruff shampoo for men, and you’ll be well on your way to meeting the higher standards of unquestionable male hygiene. Pointedly leaving the best face wash for men out on your bathroom counter isn’t going to be enough to lower the raised eyebrows of your wife or girlfriend. Keeping yourself properly groomed takes some time and grit. Using the right kind of razor can help. Waxing is a popular choice for back hair removal if only because it gets the job done fast. You’ll get your smooth back – but don’t get too excited, because you’ll also be faced with the associated costs that inevitably accompany visits to a salon. If cost isn’t a concern for you, then you can still reasonably consider this an option. However, a couple other additional drawbacks of waxing versus shaving are not being able to just do it yourself in your own time, as well as risking the growth of ingrown hairs that can sometimes occur from waxing. It’s also not entirely painless. We’ll leave it at that. Laser treatments can permanently remove hair from treated areas of your body, and thereby prevent future hair growth, but it’s worth it to note that this evidently comes with a hefty price tag. It may take several sessions of laser treatment to achieve your desired result, and these treatments can be expensive for the average Joe. As with shaving, hair removal cream is a method of removal that you can do on your own at home. The results of using a cream are mixed at best and can be somewhat time-consuming due to how long you need to keep the cream on your back for it to work. As long as you go about it the right way, shaving your back hair can be a simple task. Figure out what setting you think will work best for you. For your first attempt at least, you’ll want to have a few mirrors around so you can watch all your moves with an eagle eye. Once you’ve grown more comfortable with the process, if you have a waterproof shaver, you can move onto shaving in the shower. While your shaver will be the star of the show, you will also benefit from using some other products or tools. Just as you would use natural beard soap to groom your facial hair, it is helpful to have shaving gel on hand to reduce your chances of experiencing skin irritation. If you are shaving in a bathroom, you’ll likely already have a large mirror in front of you, but it doesn’t hurt to have a small, hand-held mirror that you can hold at an angle while you shave. For an easier time, start by shaving the upper parts of your back first. Once you’ve gotten the upper area covered – or, uncovered – you can start shaving lower down your backside. The long handle of the razor will be particularly helpful for this. In addition, don’t forget to change your razor blades regularly, as needed. Just as you would replace the blades on whatever shaving device you use for your face or beard, the blades for your back shaver will need to be looked after as well. The choice of the back shaver that will work for you is not something you can take lightly. Also, it’s not something you should try to save your money on. 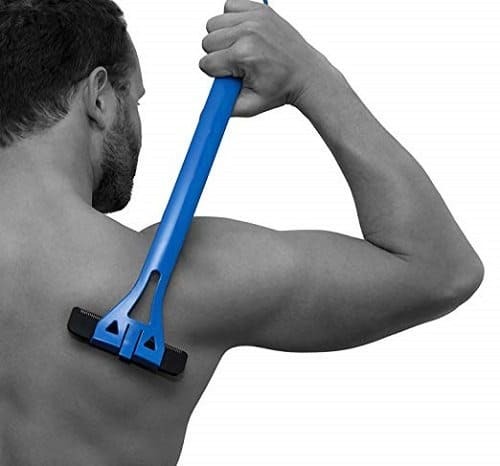 A good back shaver will help you get rid of the annoying back hairs while making sure you don’t hurt or cut yourself. One of a kind 4-inch blade and perfect teeth arrangement on the BAKblade 2.0 Back Shaver make shaving your body and the back piece of cake. DryGlide blades with safety guards can be used both for wet and dry pain-free shaving alike. The reason why you won’t experience any pain is the razor flexibility that allows lighter and less rigid friction between the skin surface and the razor. An important note – the razors are exceptionally sharp, so make sure to take it easy, don’t press hard and follow the instructions, or you can get some severe cuts. 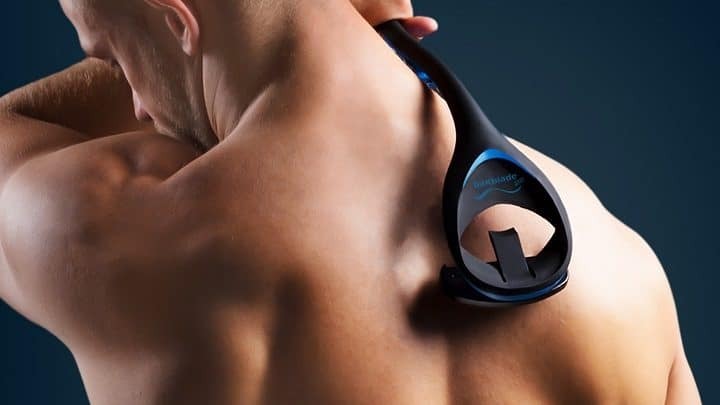 No longer will you have to ask someone else to shave your back, thanks to the long, curved and ergonomic handle that you can grip from multiple positions and reach any area on the back. The handle resembles the letter S and is designed to apply just enough pressure you need for a close shave. You can also fold it in half and take your shaver with you on travels. Just detach the blade cartridge from the handle whenever you need to shave your chest and abs or any other area of your body that is easily accessible. 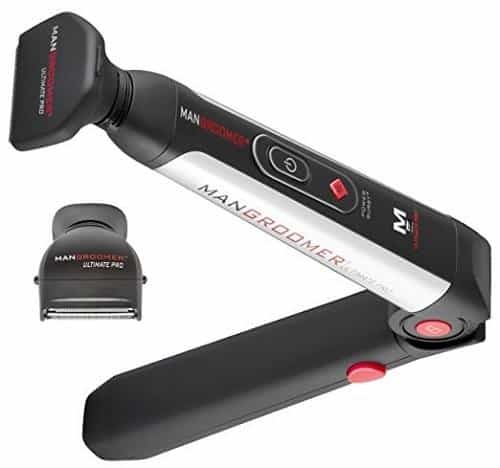 Many useful and innovative features in the ManGroomer Ultimate Pro Back Shaver make it stand out among dozens back shavers on the market. Two interchangeable attachment shaving heads have shock absorber and multifunctional flex necks. The flex necks enable a close shave and follow your back’s angle to provide the best possible contact between the blades and the skin. For shorter hairs, there is an additional foil body groomer and for the hard-to-reach areas, you will find the extreme reach rubberized handle to be pretty handy. You can also lock it at any position thanks to the Pro XL extension lock button. Shaving at any angle is made possible with the power hinge easy push lock button. This feature allows you store the back shaver in your travel bag because it locks it in the closed flat position. Fast recharging with the indicator lights will notify you when the shaver is ready for use. If you run into some of the areas with thick and coarse hairs, press the power burst button that will effortlessly shave through them. For maximum versatility, you can use this item both corded and cordless. Whether you are more into the wet or dry shaving, the BaKblade 1.0 Back Shaver has cartridges that are specially designed to allow you to shave with the use of a shaving cream or without it. No matter the option you chose, the blades of this product are unlikely to dull or rest and with the protection bar they have you will be safe from small cuts, irritation and razor burns. Your back and body hairs are less coarse and thick than your facial hairs, which is why you need a lighter pressure when shaving them. With this shaver, you get a flexible cutting blade that allows less rigid friction between the skin surface and the razor. This being said, with just a little carefulness you can have a smooth and pain-free shave. Make sure to follow the instructions thoroughly to avoid cutting yourself. This product is meant to be used without the need for batteries. Once you master the skill, you will find it pretty easy to shave your back with it. For those difficult to reach areas, the extra long handle is the most useful feature. It will not only help you get to those areas, but it will also maintain just enough pressure to provide you with a precise and close shave. The functional, sleek and modern design on the Broshaver Back Hair Shaver makes it look professional, while its features help you with removing your back hairs. Inside the package are 15 high-quality double edge safety razor blades for both dry and wet shaving. You can also adjust the cutting edge to more than 4.5 inches. Once you need to replace the blades, you can do so for a small price compared to other back shaver blades whose replacements costs half the price of the product itself. Fast blade changing with tension grab is also made possible, while the long handle helps in reaching the difficult areas on your back. The handle itself is reinforced and strong and can expand for 22 inches. 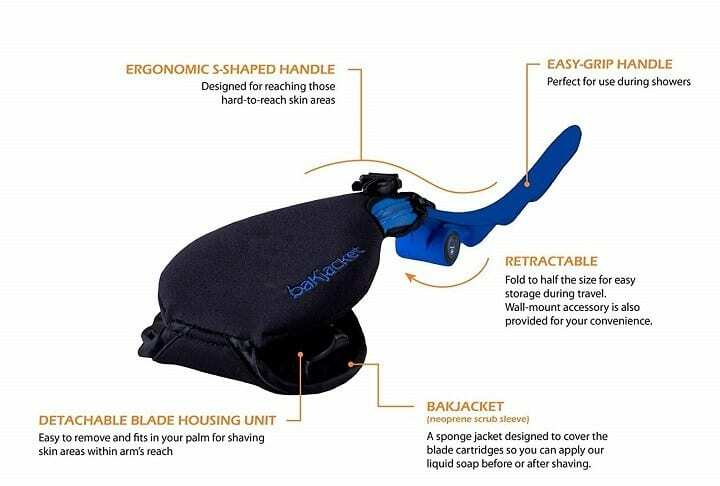 It provides you with a handy grip so that you can comfortably shave your back without anyone’s help. 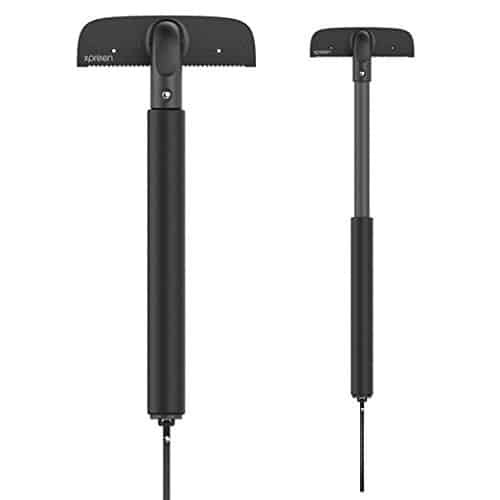 The product is 100% water resistant and made with high-performance stainless steel bolts. One of the downsides, however, is the fact that you don’t get any instructions. 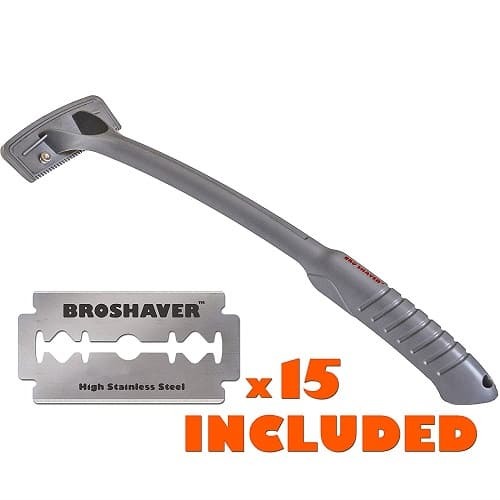 Because of the sharpness of the blades and lack of a guide on how to use the shaver, it’s easy to cut your back, which is precisely what happened to a lot of customers who bought this item. Quick, easy and painless back hair removal is what you will get with the Xpreen Stretchable Back Shaver. Its blades are sharp, so make sure to be careful and not press cutting heads too strong to avoid hurting yourself. If this is done correctly, you’ve got nothing to worry about. Sharp blades are actually your best ally when using this product, as they will remove the long hairs on your back in a split second, without having to pass certain areas a few times. Made of premium stainless steel, these blades won’t rust even after an extended period of use. One of the best features on this item is the stretchable handle, that is also hard-wearing and break resistant. It allows you to adapt the length to your needs and reach any area with ease. The cutting head can be quickly detached and replaced. You will also find the manual pretty handy as it will save you from a lot of trouble and painful shaving experiences. Compact design and real leather, tough lanyard make this back shaver portable and very convenient to bring on your travels. Photos from: lsantilli / depositphotos.com. Love to read this article. With so many options available in the market, it’s so hard to choose one. But Thanks for the Tips/Suggestions.